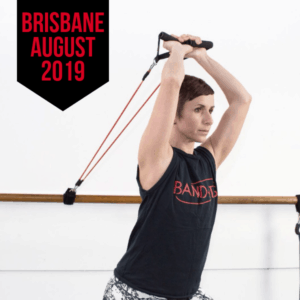 Anyone attending the Brisbane 2019 Band-ITS Barre Workshop is welcome to book in for a one-to-one physio session with Sally on Tuesday 13th August (the day after the workshop). Sessions can be booked for either yourself or your dance students. One person only per appointment. Physio appointments are redeemable with some Private Health Insurance plans. We can email you an itemised invoice for you to claim your rebate. Once purchased please email Roslyn at banditsfitness@gmail.com with your preferred time slot morning/afternoon. Exclusive for attendees/students of the Band-ITS Barre Brisbane Workshop 2019, Sally will be available for one-to-one physiotherapy appointments on Tuesday 13th August, the day after the workshop. Each appointment will be 1.5 hours and will take place in the workshop studio. Sally incorporates a variety of clinical approaches and a large amount of scientific research into her treatment methods, and sees great results! She is well respected in the physiotherapy world and is passionate about the continual improvement of her physiotherapy services. IoM Level 1 & 2. AIM – Flow Motion Model. CHEK Institute – Primal Movement, and more. Multiple courses on the neck, shoulder, and knee rehabilitation. Thai massage – Completed in Bangkok. Functional rehab and chain reaction workshops with the faculty from the Gray Institute. Nutrition for exercise and sport.